When's the Last Day to Ship Christmas and Hanukkah Presents? We're getting down to the wire now! If you haven't finished your Christmas or Hanukkah shopping yet, now's the time -- especially if you're planning on ordering online or shipping a package to someone. U.S. Postal Service: Dec. 20 is the last day to send via First-Class Mail; Dec. 21 is the deadline for Priority Mail, and Dec. 23 is the deadline for Priority Mail Express. FedEx Express: You can ship up to Dec. 23 for your package to arrive Dec. 24 if you use FedEx First Overnight, FedEx Priority Overnight and FedEx 2Day. Those services will deliver Dec. 24, but a $16 Saturday delivery fee (per package) will apply. Find more info here. UPS: You can ship up to Dec. 23 for your package to arrive Dec. 24 if you use the Saturday delivery option. Find more info here. 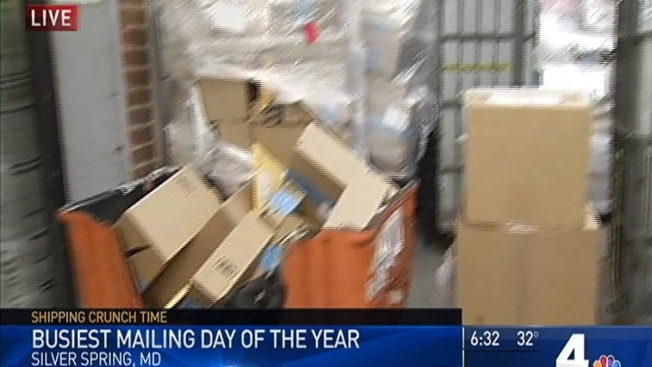 Amazon.com: Dec. 19 is the deadline for standard shipping; Dec. 22 is the last day for two-day shipping. If you get one-day shipping (available in select cities), you can get one-day shipping until Dec. 23 in time for Christmas or Hanukkah. Find more info here. BestBuy.com: You can get free two-day shipping through Dec. 20. BedBathandBeyond.com: Order by 11:59 p.m. ET Dec. 19 to get free delivery by Christmas on orders over $29. LordandTaylor.com: Order by Dec. 20 for two-day air shipping on all orders over $99, but you can get a free next-day air upgrade on all orders over $99, Dec. 21-22. Order by noon Dec. 22 for next-day air on all orders over $99. Macys.com: Order by 5 p.m. Dec. 21 to get your items in time for Christmas or Hanukkah. Nordstrom.com: Order by noon on Dec. 21 for two-business-day shipping; order by noon Dec. 22 for free standard shipping. Dec. 23 at noon is your last chance for $10 rush shipping on qualifying merchandise (not available in rural areas). Sears.com: Order by 4 p.m. CT Dec. 19 to get free delivery by Christmas for orders $49 and up. Shutterfly.com: Order by 7 p.m. ET on Dec. 19 to get free expedited shipping for Christmas delivery on orders $10 and up. Target.com: Order by 4 p.m. Dec. 21 to get free standard delivery by Dec. 23. Choose "holiday shipping" at checkout. ToysRUs.com: Dec. 19 is your last chance for free standard shipping. Order by 3 p.m. Dec. 21 for expedidated shipping, or by 11:59 p.m. that day for express shipping. Find more info here. Walmart.com: Walmart is offering free two-day shipping with no minimum for select toy purchases, or a $50 minimum for other eligible items.